A protester yesterday threw a shoe at IMF chief Dominique Strauss-Kahn as he delivered a speech to university students in Turkey's biggest city Istanbul. The protester, believed to be a student, shouted "IMF, Get out of Turkey!" as he ran towards the stage and threw the white sports shoe which failed to hit the IMF chief, an AFP correspondent witnessed. The shoe-throwing tactic was famously first used in Iraq last year against US President George W. Bush and there have been several copycat protests since. The Turkish protester was immediately overpowered and escorted out by security guards. Strauss-Kahn, who was answering questions at the end of his speech, remained calm throughout the incident. As the shoethrower was being taken out of the conference hall at Bilgi University, another protester attempted to unfurl a banner, but was also quickly overpowered by security guards. Both protesters were taken into police custody, the Anatolia news agency said. Several others stood up, applauding and shouting slogans denouncing the IMf and its "collusion" with Turkish government, which has been negotiating for a fresh loan since last year. 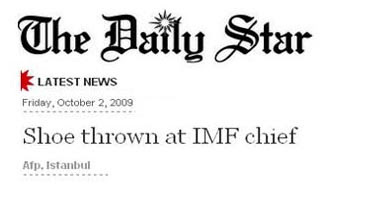 "IMF thief! IMF creates wars and makes people poor," chanted the 20-strong group. In remarks to reporters after the incident, IMF spokeswoman Caroline Atkinson gave an, ironic reaction to the protest. "The managing director noted that the students were at least polite enough to wait until the end of the discussion," she said. "The IMF needs to speak to people and listen to people even if not everyone agrees with us." Strauss-Kahn is in Istanbul ahead of the annual meetings of the IMF and World Bank in Istanbul next week. Several Turkish left-wing groups and anti-globalisation activists have called for protests in the run-up and during the meetings.